DEMAND ON THE UPSWING – Once winter hits, Whitehorse Food Bank usage rises by 20 to 30 per cent, says Tristan Newsome, the bank’s executive director. He’s seen above this morning at the Alexander Street facility. In a country where Canadians visited food banks more than one million times in one month alone last year, the figures are “unacceptably high” and striking for the territories. In fact, in March 2018, those living in the three northern regions visited a food bank more than 6,600 times. Those needing food were almost evenly split at more than 3,000 visits each for both children and adults. The findings come as part of a national report by Food Banks Canada, released Monday, which details a somewhat grim picture for areas across the country. 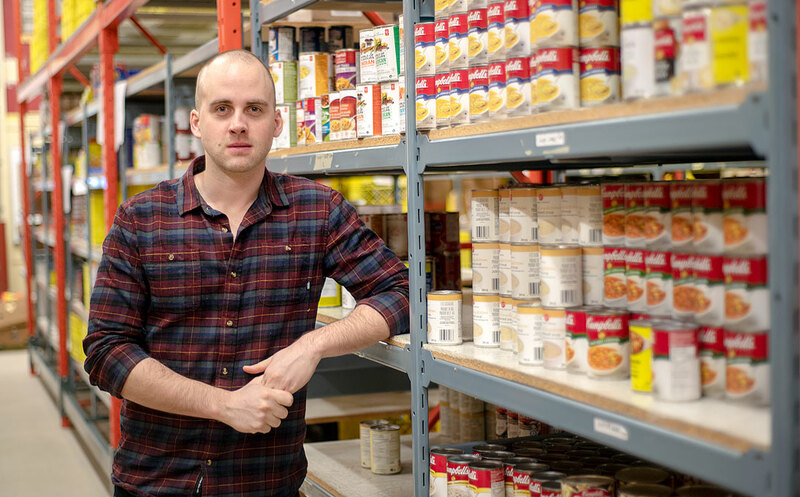 Speaking to the nearly 1.1 million visits made nationally, Tristan Newsome, who manages the Whitehorse Food Bank, agrees the statistics are well worth noting. “That number in itself is pretty striking,” the executive director said in an interview Tuesday afternoon. “But the big number that jumps out at us was (almost) half are kids under 18; that’s really crazy,” he added, pointing to the data that provide a breakdown per jurisdiction and group the territories together. (The stats are broken down in specific age groups of 0-2, 3-5, 6-11 and 12-17 years of age, but combined, they show that just over 43 per cent are those below 18 years of age). For comparison: nationally, about 35 per cent of those relying on the banks are children – despite representing only 20 per cent of the overall population. Here in the city, Newsome estimated that about 30 per cent of the city’s food bank clients are children. So, while it isn’t quite as high as that overall figure for the territories but more in tune with the national number, it still shows a need for action. Newsome wonders whether adjustments to the social assistance and welfare programs are worth examining. “I don’t know the entirety of the economic implications of adjusting our social and tax systems,” he said. However, he was able to speak to some of the concerns he’s heard on the ground from when the facility first opened its doors in 2009. “If you’re reliant on social assistance and you try to go out to the workforce and make some extra income, a lot of the benefits are clawed back in a very dramatic way. “Which creates this loop effect, (making it) difficult for people to get out of social assistance,” he said. It’s something the report echoes. One of the overall findings points to poverty being a root cause for food bank use. It cites that more than half (59 per cent) of households visiting the banks list social assistance and disability-related supports as their primary source of income. In the North, that figure sits at a similar ranking, at just over 58 per cent. One of the recommendations as laid out in the report hopes to address this, calling on the federal government to look at moving toward a basic income for all Canadians. “Under our current system of social assistance, one must be virtually penniless before being able to apply for support,” the report said. Once approved, it added, the yearly welfare income for a single person was just over $8,500. That was as of 2017, and is a figure that is more than $10,000 below the poverty line. “Waiting on provinces themselves to forge a new path forward towards a Basic Income is no longer an option,” it continued, adding that increases the need for federal leadership. Meanwhile, Newsome predicted that there could be some discrepancy among the territories, especially in areas like Whitehorse and Iqaluit. The report also reflects this, noting that there are no roads to Nunavut, making the only way to getting anything into the communities by plane or by sea during the late August to early September period. A recent summer saw Food Banks Canada help staff at the food bank there purchase food at a reduced cost from a wholesaler. It was moved to a Montreal harbour and loaded in a sea container before being shipped north to Iqaluit – a first for the community. On a more local level, Newsome added that the food bank in Whitehorse had also seen a first recently, after demand fluctuated in more recent years. “2017 was the first time since we opened that we saw a decrease in client usage – but in 2018, it was slowly tracking back up again,” he said of the site. From that time period till about 2016, he likened the usage to one that was slowly “skyrocketing” before a hopeful sign hit, showing that numbers were down for 2017. Newsome cited the 1,172 visits made to the bank during March 2017, a number that climbed to 1,324 a year later. He pegged the visits to be in the 1,300 to 1,400s in 2016 and prior – showing that the visits were high until 2016, dropped in 2017, then climbed back up last year. Asked why that was, Newsome said he isn’t quite sure. “I know in 2017, Canada was in a great position unemployment wise, it was super low. Which is fantastic, that was a factor. Still, Newsome also said the high cost of food can be an inescapable reality in the North. He predicted that once the mercury drops, usage rises by 20 to 30 per cent heading into the winter months for the bank. “Food prices are drastically inflated in a lot of northern communities, especially Iqaluit,” he added, referencing that just under half of households in Nunavut are food-insecure. As for other possible solutions, Newsome acknowledged that a number of studies and efforts have been taken to tackle things like food insecurity – among the more recent ones being changes to the federal Nutrition North program. Ottawa announced back in December that things like dried beans and bannock-making ingredients like flour, butter, lard and cooking oils would get higher subsidies as part of changes to the program. That was welcomed by northerners, as it took into account local diets. “Maybe adjusting, trying new things – our social welfare system hasn’t been tweaked or adjusted since the ’90s,” Newsome said. That can ultimately help families with the cost of food while also relieving that cost in northern areas where they are inflated, he added. Other recommendations from the report call to attention the impact food banks have on children, urging the creation of standardized affordable early learning and childcare across the country. “A central focus of federal investment should be on building the necessary infrastructure needed to physically create more childcare spaces,” the report reads. To help single adults living with low incomes, the group also suggests creating a new program to support sick and unemployed Canadians who are about to run out of their Employment Insurance or disability benefits. The Basic Income suggestion could also help in this, it added. Being a family of five and making a good income to support this family and also being as fiscally responsible as well to live within our means, it's a hard pill to swallow when you see the upcoming effects of carbon pricing and the average family's food consumption price in 2019 go up to approx. 400 dollars per household. Increased wages isn't the solution, as said below it's a catch 22, one goes up and everything follows suit. We even looked at how we could grow veggies year round, but without a bunch of money upfront and space to do it, that option fades away quickly. Hunting is an option, but you have to be successful, have all the tools etc. Maybe I'm straying a bit here but the idea I'm trying to paint here is that everyone feels it. I'd say middle class and down. The system is a square wheel rolling on a not so predictable highway, so many variables with so many opinions on how to get from point a to point b.
I don't get it, I lived in Yukon my entire life and didn't get out of 8th grade. But I showed up for work on time every day and before long found my way into good paying positions and didn't drink, smoke, or snort my wages away. I have easily supported myself and my family, I bought my own nice Whitehorse home and take vacations around the globe. When I was a teenager I never imagined I would be in the position I am today but it goes to show if you work and make some smart decisions you can make it as employers and jobs are begging for a lack of reliable workers they can depend on. My point is that I'm the classic example of someone who should be in need, but it was a personal choice to go the other route and make my own way in life instead of going on the dole. Believe me, I know a lot of professional moochers out there who are completely conditioned to use the system in every way imaginable. In my opinion food banks are an example of if you build it they will come and suddenly are enablers and training today's generation that food banks are a way of life. I hear people say they won't donate to the food bank because of the widespread stories of how that privilege is abused. There's also a common belief that there is no 'needs vetting' before someone gets food. If the food bank was only providing very basic yellow box food, instead of 'what people desire', then they could feed more people. If people want sugary processed food then they can buy it themselves instead of booze, smokes or lotto. The fact that the person writing this article didn't mention those points only reinforces those beliefs. "If you’re reliant on social assistance and you try to go out to the workforce and make some extra income, a lot of the benefits are clawed back in a very dramatic way." This is the great downfall of social assistance as I see it. It is a trap. Once you are in, it's rather hard to get out. There is discussion about a "guaranteed minimum income". The problem people have with it is that the people at the bottom get free money. But they already do. The people that benefit most from guaranteed minimum income are exactly those who are trying to get out. Suddenly getting a part-time job makes your situation better. I think we need to be less quick to judge ideas like this. You think things are pricey now just wait until the Trudeau carbon tax rears it’s ugly head. It will affect everything we buy, eat and do. Come Oct. think about that. @Nocs proves my point beautifully with that example that clearly shows that they do not understand the important difference between 'Best Before Date" and "Expiry Date". Thanks for illustrating how inattentive people confuse the two. It also shows how so many people only see what they want to see when reading comments, and ignore what's actually written if it doesn't validate their preconceived notions. The real issue here is that the cost of living in Canada keeps rising. When is the last time you heard a politician say, "how is this government plan/policy going to keep prices lower?" For me, NEVER. Instead the low resolution thinkers keep demanding more free stuff for the poor or increase the minimum wage. Both ideas become a Catch 22 situation where they once again increase the cost of living for everyone including the poor. Why is housing so expensive and in short supply? Government has not been creating enough lots so that supply and demand can meet keeping prices for housing stabilized. Why are heating and transport costs increasing when global markets for fuel and oil are getting lower? Hmm, more government policies and taxes that don't take into account the cost of living for Canadians. Really North of 60?!?? The expiry date should be ignored? Are you that simple that you don’t understand the legal ramifications of what you’re saying. I mean you must be a great scientist the way you state “expiry dates” aren’t important. No food bank in canada is able to sell expired goods. It’s a health safety and also a legal requirement. Poor people aren’t meant to have a second set of rules for them when it comes to safety. And if one of them should get sick due to expired food, they’ll have a legal red carpet to sue the food bank. Please get a bare minimum of education on the subject before spouting off such foolishness. So many of the food bank users take their bags to the alley..$10 bucks a bag.. others, who have welfare bucks spent on booze, tobacco, dope..use the food bank and either sell it off, or it's enabling them to use their food money on addictions. The case workers can watch them out their back windows. Welfare, child tax benefits, free everything, is pretty generous in the Yukon. No one starves..and everyone can have a roof if they want one too.. maybe a person doesn't want the Chilkoot, but it's still a roof. Food Banks have tripled since 2015. The carbon tax will add to the cost of food, fewer and fewer people will be able to afford nutrition.. inflation will also add to the price of food.. there will be more seniors, more families in the alley on food bank days. The necessities of a family, like milk, should never be taxed at all.. Food is another money tree, people have no choice..
@CA, then they've changed their policy. As recently as last October their food drive specifically stated no items past best before date. Common sense should tell you not to eat products that are moldy, rotten, smell 'bad', or otherwise obviously spoiled like cans that are swollen. However 'best before dates' are largely a scam to make stores take product off shelves and order more. Any product that can become harmful and still look, taste and smell OK is required to have an actual EXPIRY date. Understand the important difference because many people confuse the two. No usable food should be thrown away so people can make more profit. Stores should be required to give usable products to food banks, shelters and soup kitchens instead of throwing it in a dumpster with other garbage. Greed is the reason people go hungry in Canada. Many of those food bank users turn around and sell their groceries for a couple of bucks. On Facebook there are people regularly selling bus passes they get from Social Assistance. Put out a sign that says FREE and you will attract a wide representation of the local public. I believe there should be a means test for people who utilize the food bank. There are some with the means and income to buy their own food but frequent the food bank so they have some budget left to buy other things. Thereby putting additional strain on the Food Bank to provide food for the low income and destitute people who really need it. I suspect this situation will increase all across the country once the carbon tax has elevated the cost of everything and families become desperate to make ends meet. The food bank wastes money on name brand items rather than exclusively stocking no-name products. Also there's nothing wrong with items past their 'best before date' yet the food bank refuses to accept them. The 'best before date' is not an expiry date. Their ignorance wastes money. Better management would get more food from donations. Can You say Guaranteed Basic Income. We are moving into a world that is getting more automated and leaving too many behind. Every other type of funding gets put into one pot, including CPP, Old Age, Child tax credit and so on. Not saying food banks will disappear totally but a better quality of life will be afforded to more. And oh yes, those that abuse the privilege would be cut off. If the stores could receive a tax credit, perhaps they would donate more of the foods prior to expiry. Currently, most go into the garbage then the landfill.